Every Canada day weekend in July Charlene and I drive up north to spend some time camping in the woods. We have done it for 5 years now and it has become a tradition. 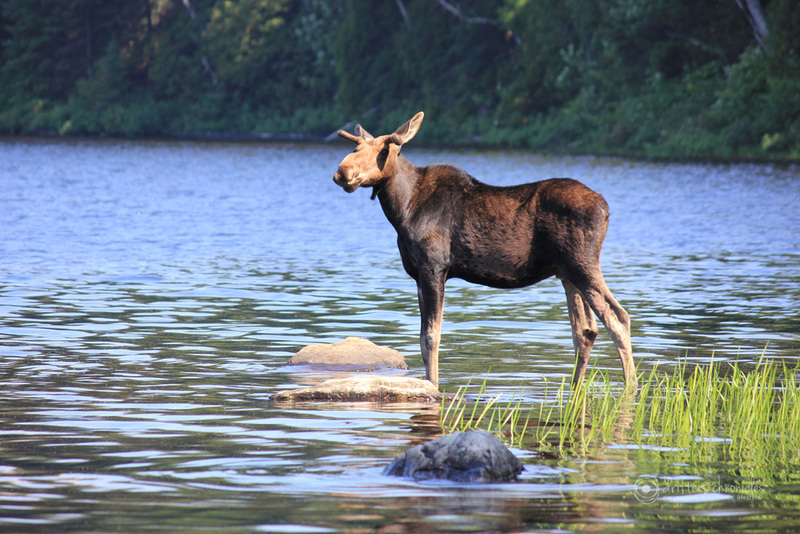 Algonquin Park is without a doubt one of our favourite parks because of the wildlife and the quiet time we get while camping deep in the woods. 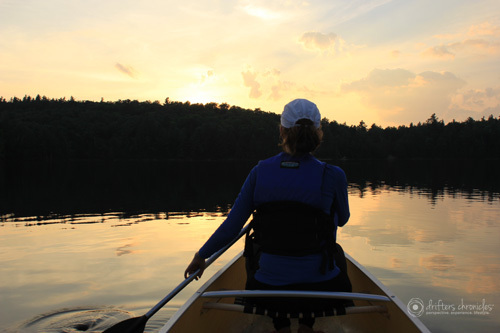 This year we decided to canoe at the southern point of access 5 starting on Smoke Lake. Smoke lake was a really large lake. This year was actually pretty easy for us considering the lack of portages. We portaged through a little over 2km which really wasn’t that bad. But the bugs were really terrible for the second year in a row and I have a feeling it was because winter stuck around with us until late April so the bugs decided to stay around even longer. 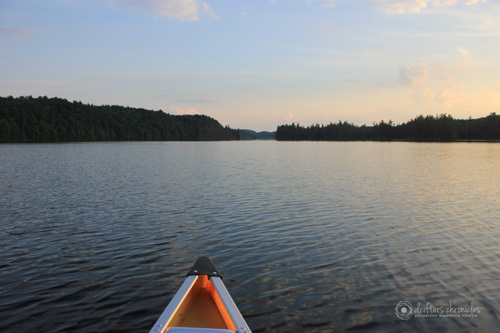 The portages and campsites were filled with mosquitoes but there weren’t any while we were canoeing on the water. The next morning, I woke up and went down to the lake to wash my face and stuff. I looked about 25 meters to my right into this small boggy area. I thought something was watching me. I looked over and thought I saw a moose. But it was early in the morning and it looked like a log because it wasn’t moving. So I hid behind a tree for 30 seconds and went to look again. It WAS a moose and was having breakfast. I got the camera and got some lovely shots of it before packing our site up for the day. 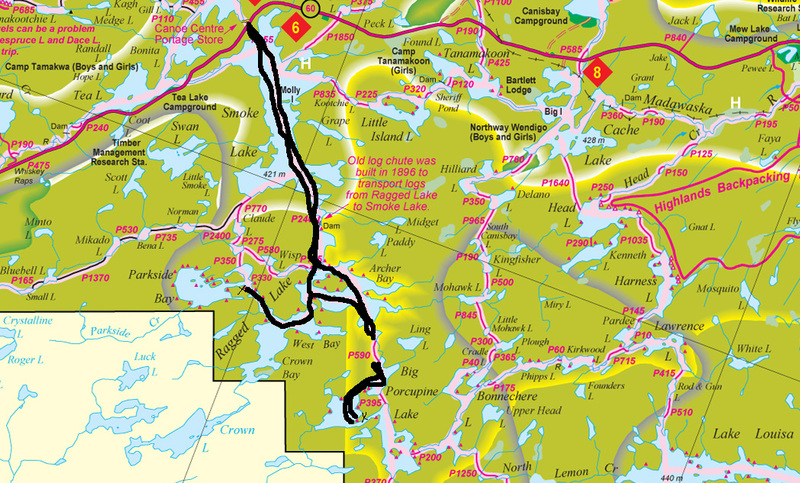 Next, we went to Parkside Bay which wasn’t so bad because there was only one portage and it was downhill. We went out to the main water in Parkside Bay but most sites seemed to be full and it was getting windy so we wanted off of the water. By the time we got to our site we could hear thunder in the background. We got our tent up and unpacked everything and had an early dinner. That night we got a major thunderstorm. You could actually feel the thunder under you and see the strikes of lightning. I was concerned that we were around trees and the thought of them falling crossed my mind. However it only lasted a few hours and we made it through the night. We left early in the morning while the water was calm and the weather was nice and enjoyed a 3 hour paddle back to the car. 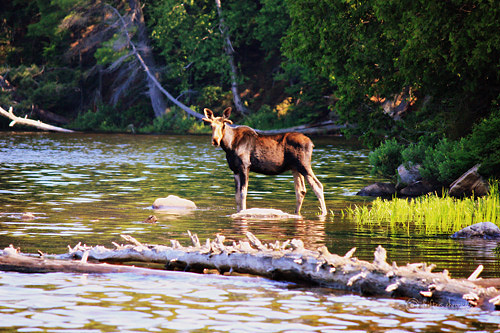 Algonquin Park is always packed with adventures and this time was no different. 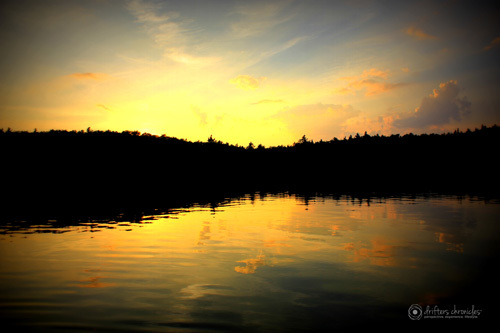 This entry was posted in Canada, Experience, His, Lifestyle, Nature, North America, Ontario, Perspective, Wildlife and tagged Algonquin Provincial Park, camping, Photography, Travel, Wildlife. Bookmark the permalink.